CKAPCO exists for fun. We do our best to have fun classes and trips and when it comes to trips, our Idaho river trips are my favorite. I have been doing them for 27 years and am as excited now as on the first one. This year we had sixteen folks along with us: one from CA, two from PA and the rest; DC Metro folks. I knew all but one from the start, but in no time at all, it was a big happy family. I've never had a better trip; never had such a great group. I will try to beat it next year though. Day 1. Another great trip begins with sixteen super people. We are able to leave luggage we don't need on the river at the hotel for later pickup going home. We left Boise via Gem Air in three small planes about 7AM on 8/12 after a day and night in Boise enjoying the local scene and cuisine. The flight to Salmon, ID is about an hour and is truly a trip by itself as you fly over, or often through, the Sawtooth Mountains range with small snow and ice patches still on the slopes. We land at the tiny Salmon airport where we put our stuff in the big drybags and ammo cans provided by the outfitter for the river. After packing we left for the river by bus and stopped at the North Fork store for beer, wine, liquor, milk shakes and even good deals on river clothes. From North Fork, we drove along the river and saw a baby moose, sheep and the spot where Lewis and Clark decided to move on to the Platte River instead of going down the Salmon. Hence the name: "River of No Return". We were greeted at the launch by the guides who had all the rafts, inflatables and hard boats ready to go. We had rented seven kayaks for the hard boaters and had a two-person shredder, two inflatable kayaks, a Torrent sit-on-top kayak and both a paddle raft and big Shredder for other paddlers along with the four big oar rigs that carry all the gear and food. The river was +1 foot above zero, or 4,400 cfs at the put in (Corn Creek) and 6,400 cfs at the usual gage at Whitebird. For perspective, our 2016 level was -14 inches and 2015 was + 0.43 feet. All these levels provided plenty of excitement. The elevation at the put-in is 3,000 feet and 2,000 feet at the takeout 80 miles downstream. Water temperature was 66ºF which eventually warmed up to 70ºF downstream. Air temperature was 80ºF with 20% humidity: very comfortable (and by the way, no mosquitoes, flies etc. on the river or at camps). After everyone got situated/oriented in their daily craft of choice, we launched with an excited glow. In pretty short order we came to our warmup rapid; Killum, to get a sense of the big-wave nature of the river. 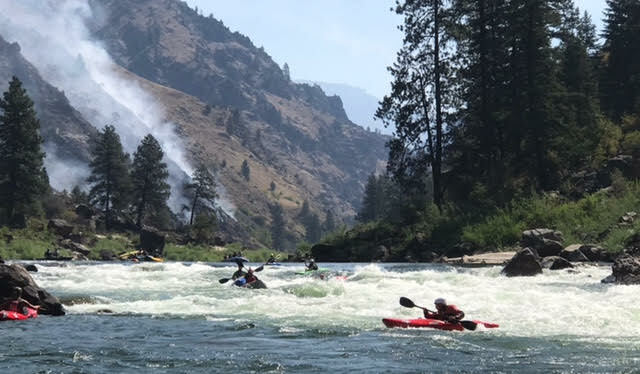 This rapid is followed by a couple more big class II+ rapids before coming to the first class III at mile 8, and then by a big, tougher class III called "Alder Creek". The latter got the best of one kayaker, but we had an easy rescue and added not even a scratch. The rapids are nearly all deep-water, so swims are painless. No one had an injury from paddling/swimming. We stopped for our usual lunch of fresh breads, cold cuts, various chips and cookies and then it was back on river with a couple more good, named rapids: Lantz and Devil's Teeth, along with some no-names (that deserve names, IMO). Our first night's camp was at Devil's Teeth Camp at river-mile 13. It was a typical Main Salmon camp with beautiful views above a rapid with white sand and level tent sites. The views from the groover (toilet) river-side were some of the most breathtaking views there could be anywhere. Dinner was steak and mashed potatoes with salad and dessert. Most slept in tents this first night, but some slept out under the stars from the second night on. It gets down to high 50sºF, so the sleeping bags feel good, as does a sweater in the morning for coffee by 6:30-6:45AM. Breakfast greeted us, usually at 7AM, with fruit, eggs and meat along with pancakes and French toast on 2 of the days. Day 2. We were up, fed and on river by 9AM and happily proceeding over some no-names and then Little Devil's Teeth rapid until we reached the class IV Black Creek rapid. We stopped to scout, as the rapid, formed in 2011, continues to change and lines are not obvious and deserve a look. I had run it several times successfully on a left route and once took a beating on the right side, however the consensus this day was to run right. Brendan could see the entrance so he and I led off. Of the eleven of us, three capsized and one did a spin mid-rapid to finish backward. It was exciting and now I have a right-side line that works. Like all the rapids on the Main, there was a moving, deep pool at the bottom and no one was injured at all. After the rapid we stopped by Barth hot springs for soaks and snacks. We had Hancock and Maisie rapids, both class III, then Baily another big III+ before stopping at the beautiful Allison Ranch for our camp. That evening most of us got a tour from Jim, the interesting caretaker of the property who lives there year around and sees cougars, bears and wolves during the cold months. He has a small cabin museum that has interesting stuff: an old sewing machine, guns, bear and mountain lion skins. Day 3. The long one. Due to the system for assigning camps to groups on the river we had a 27 mile day that started with a class II, then a class III called "5 Mile", then very quickly, two more class III: Split Rock and Little Stinker. Things eased up for two miles and we came to Big Mallard; a dramatic, fun big rapid. The guide book calls this a class IV but I give it III+. You need to run between the rock bank and a big hole through a narrow slot. As I said, it's dramatic fun. Of course there's Little Mallard (II+), another really long three-part rapid rated class IV called "Elkhorn". I really like this one as it is technical and you need to maneuver from river left to right to left. One of our paddlers had a tough time and took three swims, finishing up in a raft to settle. 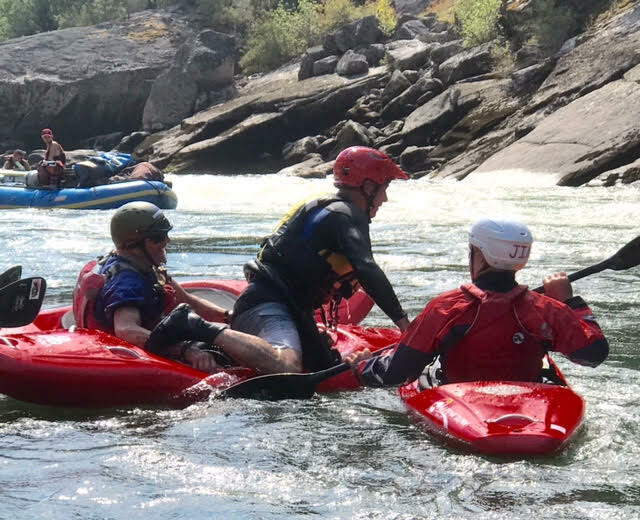 We then had Growler, Don't Lose Me Now and Whiplash; all II+, then China Bar (class II and Boise Bar (class II+) before arriving at Buckskin Bill's after twelve major rapids. I was ready for camp, but we had six more miles to go. I don't like any commercial entities in the wilderness personally, but Buckskin's has some interesting stuff as well as ice cream, which seemed to please a few, I was holding out for beer. Back on river for the final eight miles, we reached Action Jackson rapid (II+) then Ludwig which was a tough III. We were then at river mile 60.6: Mann Creek Camp. Some of the rafts and guides had gone on ahead to start setting up for dinner. This was a BIG day. "chill·ax": ˈCHilaks/ verb, informal: calm down and relax. Day 4. The short one. Atypically, we lazed around this morning before launching about 10:30AM for an itty-bitty ten-mile paddle with several class IIs and some interesting scenery, including Polly Bemis Ranch, with most ending up at camp by 1:30PM. The camp, Bull Creek, was another beauty with good hiking trails and a trout stream running through it where our fisherman caught eight native trout. After dinner, we had the (dreaded by some) "talent show" which includes dressing up in strange garb. I wore an off-the-shoulder dress that Debbie picked for me. Talent ran the gamut from Koala bears look-alikes, poetry, song, mime and weird dance to Indian leg wrestling. Prizes were awarded. Day 5. We took our time and got away from camp about 10AM and after a couple scenic miles, came to class III- T-Bone Rapid and could see some smoke toward our destination but nothing that was bothersome. Next up was Dried Meat, class III- where the Shoshone dried salmon. On to Chittam rapid which was a big class III/IV and quickly, after the last biggee called "Vinegar" (III/IV) where there just doesn't seem to be a clean line, I took what looked best and it worked out for all but three, who capsized with two swimmers. They got fixed up quickly by our paddlers with no injuries. A bit later we ran Carey Falls (II+) and then a final no-name to our take-out at Carey Creek ramp. We unloaded our gear into bags for home, had a good lunch with beers and milkshakes available and got in the bus for our ride to McCall and hot showers. My descriptions are pretty dry but what puts so much value in these trips are the people. Brendan played guitar along with Ken and others, singing and story-telling around the nightly campfire. The morning smiles that came with the damn good cowboy coffee. The ride back to McCall seemed long as civilization crept back into our systems along with the inevitable email, voice messages and texts. The hotel was fine and everyone seemed to enjoy the many eateries and the town itself. We loaded up about 8AM to get everyone back to Boise Airport before noon. The drive back is along the North Fork of the Payette River so we all were able to see class V+ in action and the race course sections. Boise airport is very user-friendly with a couple of good restaurants so some of us enjoyed a final lunch before the trip home. The wilderness river, its scenery, camps and rapids are spectacular. The stars, the nights, the mornings, and days are all so cool. But, it's the people that make the experience: the participants and the guides. If only the world could run like our trip, with sharing, caring, consideration, hard work and constant smiles. Everyone was truly great with everyone. We had some very experienced and several totally inexperienced to this kind of trip and, as usual, it worked so well. I am super happy again and look forward to next year's adventure. You should come. Enjoy CKAPCO's full photo gallery of this fantastic trip here. Newer PostWhere's your next adventure?